For more than 150 years, Winchester has been shaping the shooting world. One of the most recognized and respected names in ammunition, Winchester represents pride, heritage, quality, and innovation. Developed specifically with law enforcement in mind, Winchester’s Ranger series are some of the finest self-defense loads on the market today. 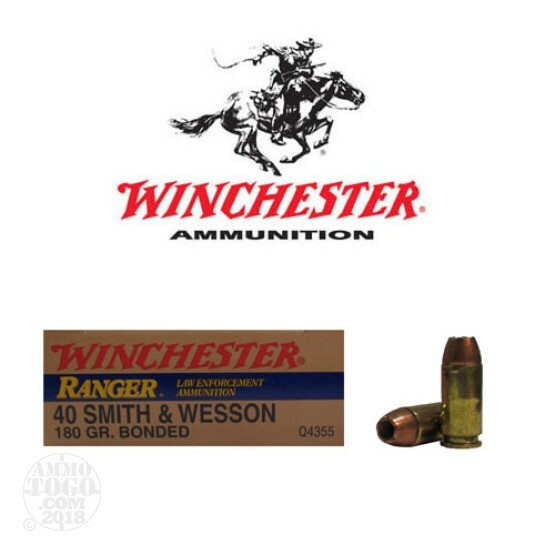 This package contains 50 rounds of Winchester Ranger .40 Smith & Wesson ammunition. Each round is loaded with a 180 grain bonded hollow point projectile. These bullets are manufactured using a proprietary bonding process that eliminates the limitations of the traditional copper-plated projectile. With a permanent core-jacket bond, these loads deliver maximum weight retention and excellent penetration through tough barriers like steel and auto glass. The bonded jacket works in unison with the hollow point cavity to deliver reliable, controlled expansion upon target impact. Carving a massive wound channel, these rounds produce reliable threat-stopping power for personal protection, whether on duty or off. This ammunition is new production, non-corrosive, and boxer primed. Featuring reloadable brass casings, each round produces a muzzle velocity of 985 feet per second and 388 foot pounds of threat-stopping muzzle energy.